This has been a bit of a quick and dirty from the outset but evolved pretty quickly into what you see here. The first jackshaft is housed in a piece of 1 inch schedule 40 pipe which has a rough ID of just over .750 inch. I originally had bronze bearings in it but now have needle bearings with an ID of .500 inch and OD of .750 inch. The needle bearing are a tad over size to make for a press fit into a .750 inch hole. The ID of the tubing has a bit of a rough finish so the bearing have so far stayed in place in spite of being a relatively loose fit. I originally had no seals but have since added seals on each end to keep the lube in place. If I were to try to duplicate this on a KMX Typhoon (I hope too in the not to distant future) I think I will get some chrome moly tubing which would be both lighter and a better fit.... tho in practice it has not been an issue so far. If it becomes an issue (loose fit) I would probably just use locktight on the bearings to insure that they stay where intended.I machined a piece of aluminum to go into the BB for the second jackshaft. The hole in it is offset to allow for tensioning the belt. It is held in place in the BB by a set screw. It has the same needle bearings and seals as the other shaft though a much tighter fit. I'm using .500 inch hardened shafts both places. 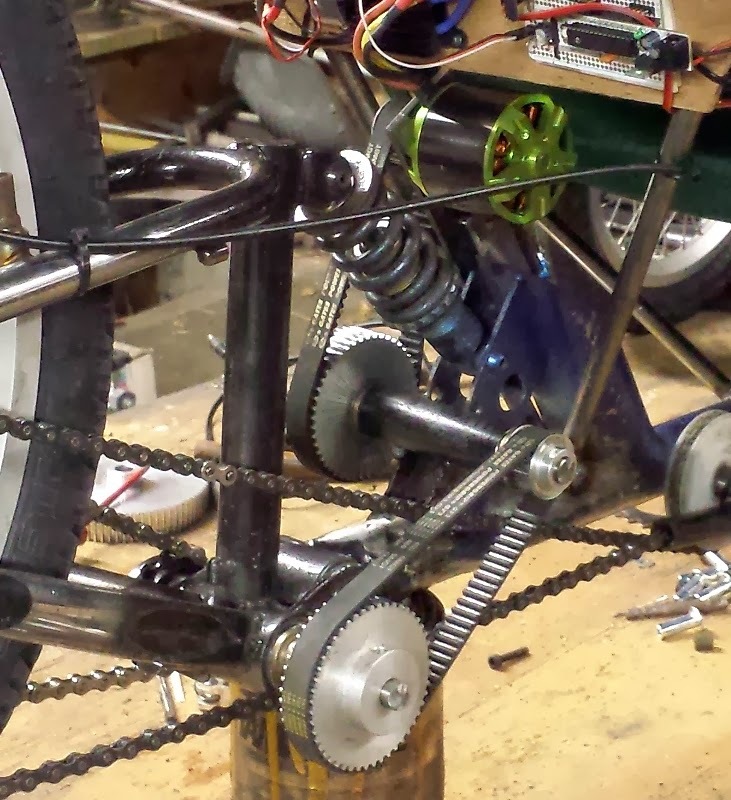 All the pulleys and freewheel adapter are held in place by set screws onto flats ground in the hardened shafts. Not overly elegant but effective. The belts are both 450 mm length 15 mm wide and are the 5m htd tooth style.